For the first time in nearly a decade, nonviolent civil resisters caused a disruptive breach of the backcountry security zones at Vandenberg Air Force Base (VAFB), coinciding with the 50th anniversary of the Cuban Missile Crisis. VAFB enforces a sweeping global pattern of violent high-tech military abuse. Three participants were arrested for federal trespass and others eluded base security patrols. One participant [Theo Kayser] was hand-cuffed face down on the ground with an M-16 automatic rifle trained on his back during his 2 a.m. arrest, while search lights swept the surrounding hills. He was then held under armed guard for nine hours at a special security command post which VAFB had set up to deal with the backcountry occupation. Vandenberg security stated that they believed at least 15 individuals were spotted in base security zones between 0ctober 20th and 21st. Action participants hope that others will follow their example in the months ahead. They entered the huge U.S. Strategic Command facility at widely dispersed points and hiked miles into the base, crossing fences and rough terrain under cover of night, hanging banners on nuclear first-strike missile silos deep inside Vandenberg. They also conducted an unauthorized Christian prayer liturgy and exorcism of evil inside VAFB boundaries. Multiple sources, including contacts within VAFB, confirmed that the announced plans and the backcountry security zone occupation caused days of disruptive base alerts, interrupting Vandenberg’s business as usual to prepare for and deal with the security zone breaches. Arrested action participants include Franciscan Priest Louie Vitale and Los Angeles Catholic Worker community members Theo Kayser and Rebecca Casas. Delivered to VAFB on October 21st by Franciscan priest Louie Vitale, and Los Angeles Catholic Worker community member Rebecca Casas [both of whom were arrested by base security]. Exactly 50 years ago, this planet was brought to the brink of complete destruction during what is referred to as the Cuban Missile Crisis. We believe that all missiles are a crisis (whether located in Cuba or elsewhere) as they are contrary to the laws of the Creator whose names are many, but whom we call (as did the evangelist John) LOVE. Vandenberg AFB has continued since the near catastrophe of October 1962 with its preparations for both nuclear and “conventional” war through continued missile tests, launches of military satellites and other preparations for killing in violation of the commandment, “love one another.” Acknowledging that love is an active rather than passive state of being, we cannot sit by while the evils of Vandenberg AFB are allowed to continue unchecked. We acknowledge that the land on which Vandenberg AFB is located was stolen from its true owners, the Chumash people. We understand that the missile tests conducted here pollute both the coast of California, with exhaust from rocket fuels, and Kwajalein Atoll of the Marshall Islands, with depleted uranium. It is our belief that the millions of dollars spent on war-making and preparations for war could be used to feed those who are hungry, house those who are homeless, and provide health care to those who are sick and we consider it a sin that schools are closed and homes foreclosed upon while military spending goes unchecked. Because of these sins and innumerable others, we have come to this place to pray for peace, in the form of nonviolent direct action, with the belief that “wherever two are more are gathered” there is God. Without question, Vandenberg AFB is a place in need of God, whose gospel is peace and whose message is reconciliation between all peoples. Our hope is both that our action will somehow hasten the kingdom of brother and sisterhood and that others will heed our example and nonviolently “occupy” this base in the weeks and months ahead for the purpose of transforming this land from a place dedicated to death into one of hope and love. Read article in Saturday’s Santa Maria Times HERE. Posted: October 22nd, 2012 under News. Three of the five Hiroshima Day resisters (Theo Kayser, David Omondi, and Tensie Hernandez-Apel) appeared in Santa Barbara federal court on Thursday, October 18, pleaded guilty, whereby each received a $150 fine plus court costs. All three stated that paying a fine and court costs is not acceptable and stated their refusal to pay. No further action was taken by the court. The two other resisters (Rebecca Casas and Barbara Robinson) have a November 15 arraignment date. Posted: October 18th, 2012 under News. Charges were dismissed on Wednesday, October 17, in federal court in Santa Barbara, Calif., against fifteen people, including four members of Veterans For Peace, who were scheduled to face trial on Wednesday as a result of their nonviolent protest of nuclear warheads at Vandenberg Air Force Base. The 15 were arrested on February 25th for protesting the launch of a Minuteman III Intercontinental Ballistic Missile from Vandenberg to the Kwajalein Atoll in the Marshall Islands. See video HERE. The Veterans For Peace facing trial were Pentagon Papers whistleblower Daniel Ellsberg of Berkeley, Calif.; Fr. Louie Vitale of Oakland, Calif. and Las Vegas, Nev.; John Amidon of Albany, N.Y.; and Mark Kelso of Las Vegas, Nev. The district attorney moved to dismiss all charges. Two of the defendants, John Amidon and Toby Blome, wanting to raise their concerns about the Minuteman III missiles in court, offered motion not to dismiss. The judge sided with the district attorney. Some of the same people will be among those protesting again on November 13th when another missile test is scheduled. McGregor Eddy, one of the defendants, called the dismissal a victory. “The military,” she said, “wants to avoid drawing attention to thermonuclear warheads that serve no purpose and cost a great deal of money. Many young people don’t even know about these nuclear weapons. When we say ‘nukes’ they think of nuclear power.” Fr. Louie Vitale agreed, calling the dismissal “a great victory.” Vitale added, “I’ve been on trial here several times and always lost. 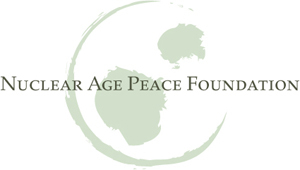 Vitale said that the public in Santa Barbara had learned a great deal through the work of the coalition formed around this protest and near-trial, including with the help of David Krieger and the Nuclear Age Peace Foundation. Three of the five resisters (Theo Kayser, David Omondi, and Tensie Hernandez-Apel) arrested on Hiroshima Day will be arraigned on Thursday, October 18, 2012, at 8:30am in Santa Barbara Federal Bankruptcy Court, 1415 State St, Santa Barbara, CA 93101. The two others (Rebecca Casas and Barbara Robinson) have rescheduled their appearance for a later date, which will be posted as soon as dates are confirmed. Posted: October 15th, 2012 under News, Upcoming Events.